Compared to Porsche's curve and Lamborghini's sharpness, Ferrari is between both of them, with sharp curves while retaining curves. 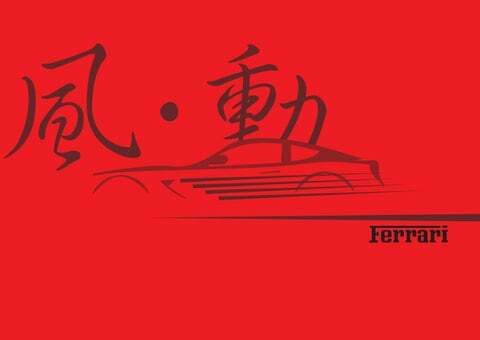 Landscape Architecture Ferrari founder started at racing, so we use race track to design our landscape. The white road extends from the building. At the exit there is an arch symbolizes start and finish line.There is an auditorium on the left side, different height of the audience can make an outdoor seating area.The road in front of the auditorium is creating a maintenance area to show the car at outdoor.The whole atmosphere was created for the vehicle owner who just finishes the race and needs to take a rest. The roof can use guide to collect the sunlight into the room. In the exhibition area, the column is made into a streamlined shape of the car body with a gradual curve, not only can avoid the column, but also produce a penetrating feeling to see the car. In addition to enjoying the desserts, you can also admire the car inside the Exhibition Area from VIP Rest Area.